A quick blog for you, as I'm operating on less than 3 hours of sleep after a delayed flight back from New York City. I'll tell you what though, it was well worth it. That's the most Gooners I've been around for a long, long time. Perhaps too long. The game itself doesn' warrant much review, but it was the fans that made this trip what it was. My first time in NYC and it was everthing I'd hoped for. To see fans from all around the world was magnificent. I've lived in the United States for 18 years now and it's fantastic to see the support for Arsenal Football Club has grown as much as it has. I met groups of fans from DC, Florida, Canada and even India to name just a few. Before the game a good chunk of the Arsenal support met in a bar not too far from the Red Bull Arena. A couple hundred of us marched to the stadium, and the American fans did not disappoint. I'm still a little horse but isn't that why we go to games? The stadium wasn't full, but the vast majority in attendance were Gooners. I was lucky enough to land tickets next to the vocal part of the stadium, and although we didn't have much to sing about, we still sang. Thierry Henry obviously got the biggest cheer of the night - perhaps an appreciation for "missing" his chance early in the game? The Arsenal support did get to cheer though. Diaby curled a lovely shot into the net from the corner of the box, only for it to be ruled offside. It was not to be our day on the field, but we had our day in the sun rain, that's for sure. When I saw Monreal line up alongside Hayden in the center of defense I had a feeling it might not be the perfect Saturday. Then when I saw that Rosick was pretty much our striking option in the first half, I realised our best chance at a goal was Henry pulling on an Arsenal shirt for the second half. It was not to be. The signing of Calum Chambers makes it look like Jenko might not be with us this season, whether on loan somewhere else, or perhaps a more permanent deal could see him pushed out of the rotation. All in all a fantastic weekend. A huge thanks to all the Arsenal fan I met and befriended while in NYC. I hope to have made some lasting friendships, and here's to building on our already promising Detroit support. 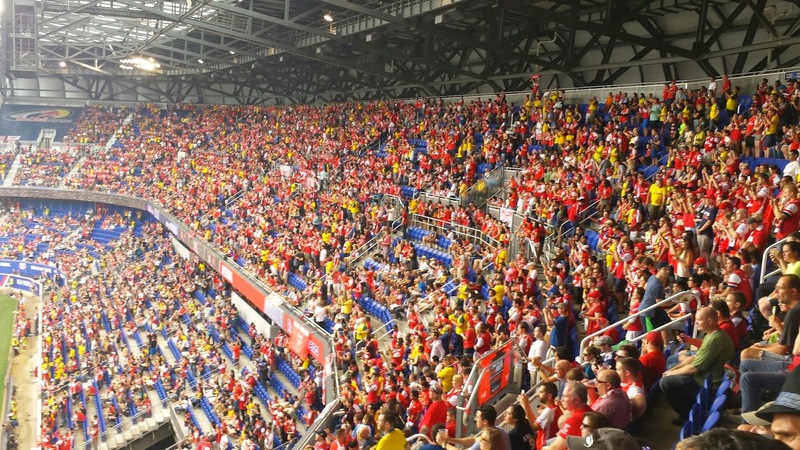 1-0 to the Red Bulls, but a win for Arsenal fans worldwide in my opinion. Great to see and long may it continue.